As you may be aware from last year's newsletters, the Department of Food Sciences at Stellenbosch University hosts an annual food science's competition, where our best, brightest bakers are tasked with solving a particular problem. If you have read the previous articles, you'll be aware of the incredibly high standard of both ingenuity and execution we've come to expect from these final year students. 2015's 'Stealth Health' competition saw the world being served the wonder of S'cool Beans, the sneakily wholesome low-sugar, low-sodium spread that went on to place second at the International Union of Food Science and Technology global competition in Ireland. 2016's theme of Nutritious Treats for Kids with Food Sensitivities (every word in there is a criterion for entrance) was as relevant as ever, considering the increasing number of food sensitivities, especially in our younger citizens. But the challenge was bigger than just the creation of healthy snacks – each product was also required to be sound scientifically, marketable and have at least a 7-day shelf life. The most recent competition saw 6 entrants vying for top-spot with their equally brilliant peers with some of the most remarkable innovations yet. Gell-O-Pop is a fruit and vegetable-based jelly lollipop, with an accompanying coconut popping candy sherbet. Pudding Clouds are cookie cups, filled to the brim with a vegetable (and yet still deliciously desserty) filling, and crowned with marshmallow. Holey Moley (indeed!) is a doughnut made from pumpkin (rather than flour and sugar), and glazed with coconut milk, vanilla essence and a honey/cinnamon crumble. (Innovus' William Cloete has been heard describing Holey Moley as "The best darn doughnut I've ever had!"). Mmnandi is a fruit flavoured mousse, but crafted from potato milk (believe it or not), while No-moo decided to create a strawberry and caramel frozen macadamia nut milk and root vegetable dessert. Delicious, nutritious kids' food, with packed with healthy, natural ingredients and happily light on allergens and animal products. The most impressive of the lot, and the winner, was the rather delectable, Jungle Bungle. The team, who initially set out to develop a vegetable-based cultured soya product as a yoghurt replacement (there are only two available locally at the moment, and neither are vegetable based), ended up also creating healthy, edible cutlery – both of which had their flavour profiles paired with each other. Yes, that's right: you eat your healthy, allergen-free, beetroot-and-cocoa 'yoghurt', and then you eat the seed-and-honey biscuit spoon! 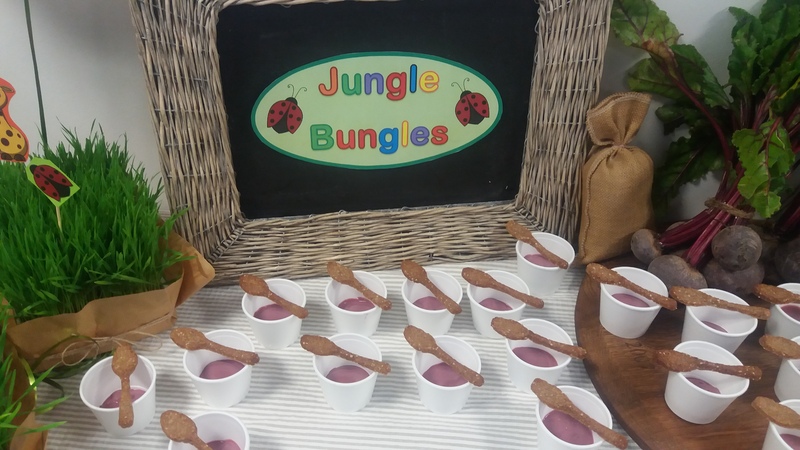 The Jungle Bungle team cleaned up in all three of the judging categories, being voted Most Commercialisable, Most Innovative and the Crowd Favourite. With a R7500 cash prize in their pocket, the Jungle Bungle inventors will also have Innovus' support, and network of connections, as they set out to promulgate and commercialise their tasty new innovations, and get them to market. We're expecting that, like the judges on the panel, investors and FMCG companies are just dying to dig in.